So I've debated whether or not to share this video. Partly because it seems boastful, and partly because there is some profanity in the background. I've decided to post it because it was one of the most incredible things I've ever experienced and it would be shame not to share it with my friends. So here it is. This is me at a conference in Austin Texas, where I met 150 people and memorized their names in less than two days. The hosts asked for a demonstration, and Jackie Dana took a video. (The F-word is close to the 9 minute mark if you want to avoid it.) #smarterartist summit. Yesterday I had the chance to visit Branford High School in north Florida(And Middle School). What an awesome place to visit! The students were courteous, talented, and ready to listen and learn. The media specialist, Karen, was so passionate about the kids, and is an example of what type of person we want in our schools. The event started with a large assembly, where we got to speak with 600 kids on a variety of topics. I spoke on publishing and stressed how they can get their work published now. Following the assembly, I went to the classroom of Mr. Wingate, who is a supreme example of an awesome teacher. In the smaller setting I had the privilege of speaking to his english students on writing, editing, and publishing. They were attentive, curious, and had excellent questions. Following the class visit we participated in a book signing in the media center. The kids were great, and came up to me to share their (incredible) artwork, talk about their writing, and other literary interests. There were so many memorable kids I couldn't possibly name them all, but there are a few that I wanted to call attention to. Rachel, thank you for sharing your favorite books. Ashley, thanks for taking so many great pictures of all of us. Bryce, keep writing. I enjoyed reading the sample you brought. Haley, Keep up the awesome artwork. Austin, rock the 'stach! And to the un-named kids that had me wear a lama hat and join them in a selfie, I want a copy. Thanks Branford for the great experience! New Smyrna Beach Book Festival this weekend! I am excited to participate in the New Smyrna Beach Book Festival this weekend. Along with 50 author authors and speakers, I will be there to socialize, sign books, and speak. This is a big event, so I am highly looking forward to it. It will also be my second event with print books and book signing. If you would like a print copy of Elseerian (With illustration) feel free to stop by and grab one. On another note, I have officially passed the 50,000 books sold mark! Who knew my series would come so far, so fast. Certainly not me! Thank you to all my readers for your support! Tomorrow is the Florida Authors and Publishers Association conferance. I will be sitting on the panel answering questiosn about publishing, and I couldn't be more excited. This year the event is in Daytona, and it's my understanding that the panel participants get a surfboard after the event. That's correct, right? Right!? So I am just 11 days from my first book signing on August 3rd. I am finishing placing the orders for the books that will be available for purchase that day. I must admit that I am excited to participate in such a large event. As I have mentioned before, it will be located in Orlando at the Indie Bookfest 2013, I will be sharing the spotlight with over 30 other authors. Of special note is Isaac Marion, who accepted the invitation and will also be present. 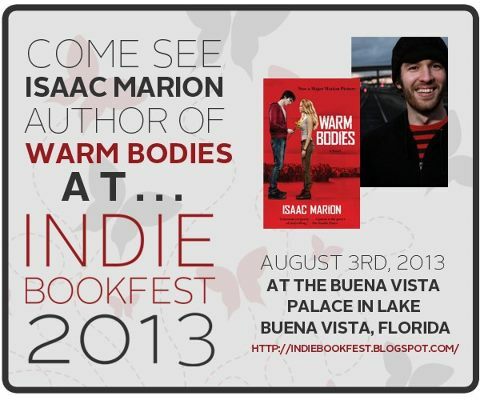 As the author of the best-selling book, Warm Bodies, he will be an excellent addition to the party. If there are any of my fans who would like to get their book signed, or purchase a book in person, I hope you will consider stopping by. I hope to see you there! Check out part 1 of a Ben Hale author interview. 5 days left until The List Unseen goes live. Don't forget to like the Elseerian page for a chance to win a number of Amazon Gift Cards. For anyone interested in learning more about Ben Hale you can read the first part of his interview with Tim Flanagan at his website. To learn more about the contest, check out the blog post from last week. Anyone need a speaker for a writing group in Utah? I will be there Thursday June 6th! I am looking forward to an upcoming trip to Utah in early June. I will be attending a wedding on the first weekend, and wanted to see if anyone would like me to stop by their writing group on Monday June 10th. Just send me a message through facebook or my website if you would like. I look forward to sharing some of my experiences! I am so excited for this coming weekend. This Saturday I will be speaking at the Florida Writers Association Spring Conferance. The topic of my remarks will be E-Publishing and Kindle Marketing. Almost a year ago today I heard about e-publishing for the first time. Diving into research I was astounded at the discoveries I made. I took the plunge and uploaded my first book on June of 2012. In just 10 months I have sold 35,000 books and I now write full-time. Throughout this last year I continued to do research, and now find myself in the position to help others. A year ago another author helped me understand the basics of kindle publishing. This Saturday I get to return the favor. If any of my readers happen to to be going to the event send me a message so I know to look for you! You can see the location on my News and Events tab, or visit the FWA website. I am happy to announce that I have scheduled my first book signing. Located in Orlando at the Indie Bookfest 2013, I will be sharing the spotlight with over 30 other authors. Of special note is Isaac Marion, who accepted the invitation and will also be present. As the author of the best-selling book, Warm Bodies, we are happy to have such an experienced author join us. Since this is my first official book signing, I look forward to meeting my readers and hearing their thoughts about my series. I also intend to have a shirts, bookmarks, and other paraphernalia for sale. Please feel free to send me a message if you think you can make it.